Matt Torrey's - a new beer bar on Bushwick Ave. in East Williamsburg. 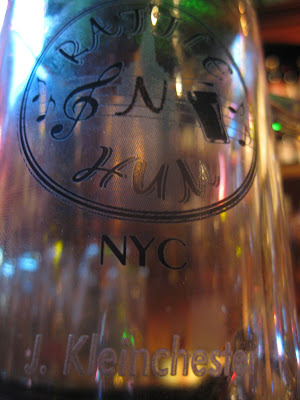 Quite a few rotating craft taps, including Brooklyn Brewery Dark Matter when I was there this past Thursday. The bar that has emerged as my most frequented is Barcade. They have almost weekly (excellent) events and its a great space. PLUS, arcade games! Above is from the aftermath of the Sierra Nevada event, L to R the Fritz & Ken 30th Anniversary Stout, Crystal Wheat and the 2004 Bigfoot. Another of the Fritz & Ken. Not only do they have great beer, but they have clever advertising as well. Rumor has it on the interwebs that Barcade has been looking into expanding into Jersey City. This is excellent news for me since I just moved there. All I've heard so far is that its going to be a bigger space. Does anyone have any further info? Yesterday was a good day. Normally I'm supposed to show up for my job at 9:30am. Since I knew that it was going to be Founder's release date for their very limited brew Kentucky Breakfast Stout, work was going to have to wait. A few weeks before I had contacted a couple of local liquor stores known to carry good craft beer. Two out of the five or so that I contacted claimed they would be receiving at least 1 case oft-sought-after KBS. In fact, the store that's a mere 2 blocks away from my apartment in JC excitedly told me that they'd be getting 2 cases and there would be no bottle limit. Cut to Monday morning. I show up to my local place as they open at 10am and they don't have any. They had received a shipment of just 1 case, but it somehow was nowhere to be found in the store. They did have the Nemesis however, so I bought my consolation beer and brought it home. I also left my name and number in case they stumbled upon any more KBS, as they said they still had some logged in their computer system. I suddenly realized that Super Buy Rite near the Holland Tunnel had said that they'd have it first thing Monday. Its about a mile walk from my place, but I called and they had it so I was off. I met the beer manager, Joe, who was a great guy. We excitedly discussed KBS and how his store was already quite possibly the best beer store in NJ. I bought my 2 12oz bottles (the limit there) and was on my way to work. Later in the day, I got a call from my local place and they had one 4 pack with my name on it waiting for me once I got out of work. When I got there to collect my "winnings", I found out that at least some of their KBS was sold via their online system, which I didn't even know existed. I'm willing to be the rest was set aside to let the employees have and I just got lucky that one was left to buy afterwards. All in all, 6 bottles of Kentucky Breakfast, 4 bottles of Nemesis = good day. 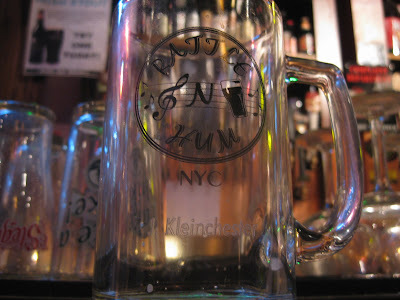 Back in Sept '09, I completed the challenge "40 Beers in 30 Days" in order to become a part of the illustrious Mug Club at the still-new, always-good craft beer bar Rattle'n'Hum. Since then, I've enjoyed Mug Club discounts every time I go in. One thing missing though? MY MUG! First I had to wait because they place mug orders in large groups to cut down on shipping cost, then I had to wait because my mug was the only one to come back messed up. Well, this past week I was finally introduced to the finely constructed glass that will call my poured beer home (albeit very temporarily...its easy to drink beer quickly at RNH). A bit self-indulgent as a blog post, yes. But it was a fun thing to do that pushed me to try much more beer that I might not have normally tried. 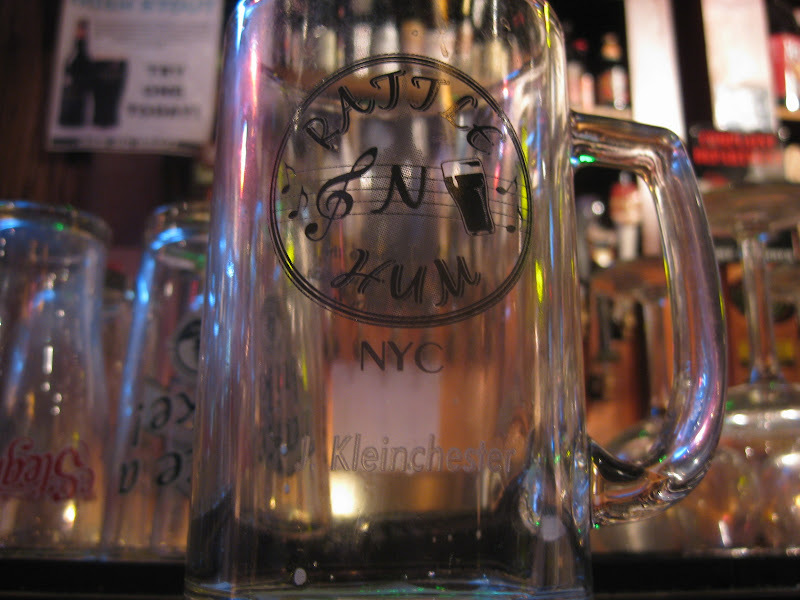 So go get drinkin' and get yourself a mug! A few weeks ago, right in the midst of my move from Brooklyn to Jersey City, I participated in another "Beer It Forward" with some fellow beer enthusiasts. The best part about the BIF in comparison with a straight trade is the surprise. You send beer off to someone, but they're not the one who sends beer to you. And in most cases, you don't know who you're receiving from OR what you'll get until the day the box arrives. For reference, here's a post regarding the last one I participated in. As you can see above, the box I got was pretty awesome. I've never had the La Folie before, which I've been hearing about forever. Then you've got two excellent Russian River brews that you can't get here in NY/NJ. THEN there's the beers from Deschutes (which I'll be visiting in Oregon next month) capped off with Port, Ska and Oskar Blues beers. It was a great package. 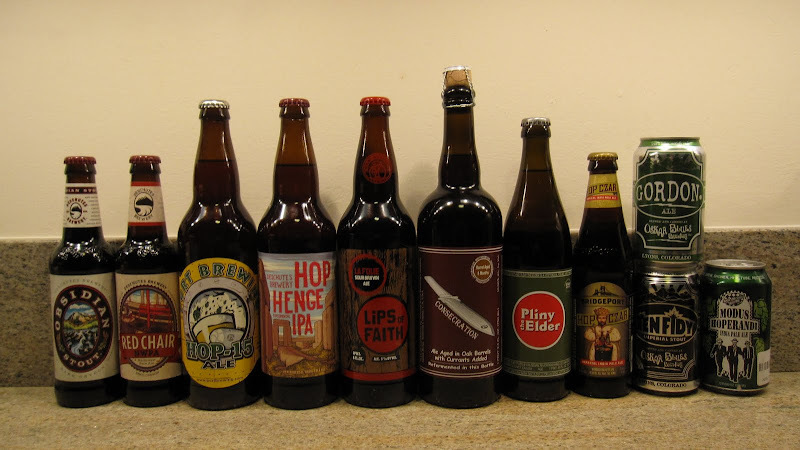 I've already had the Ten FIDY, Gordon, Hop Hendge and Red Chair, but have been holding out on everything else. At LEAST one of those bottles is disappearing this weekend. 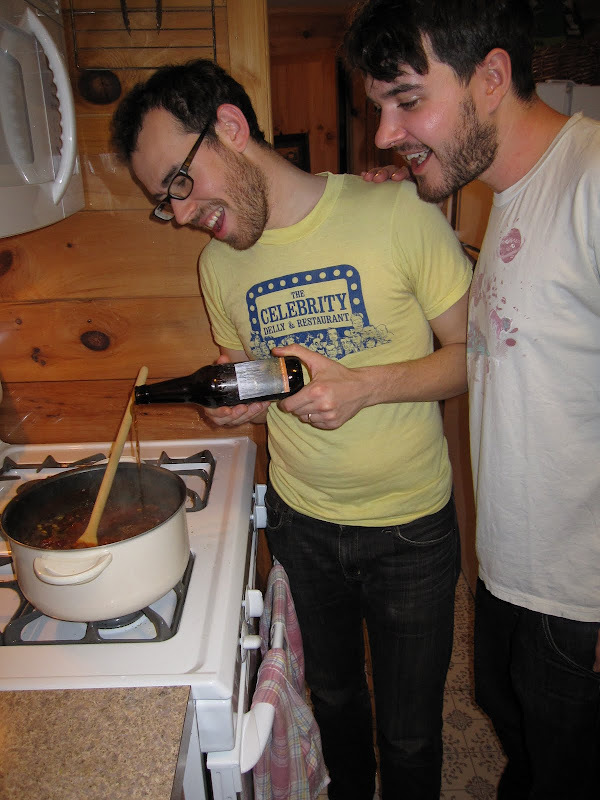 Makin' Chili with Award-Winning Homebrewed Smoke Ale! Yes. Its been a long time. I've been neglecting. But we're back in business! Just last month, my homebrewing team and I along with our lady friends traveled to Stratton, Vermont for a weekend of skiing, beer and food. 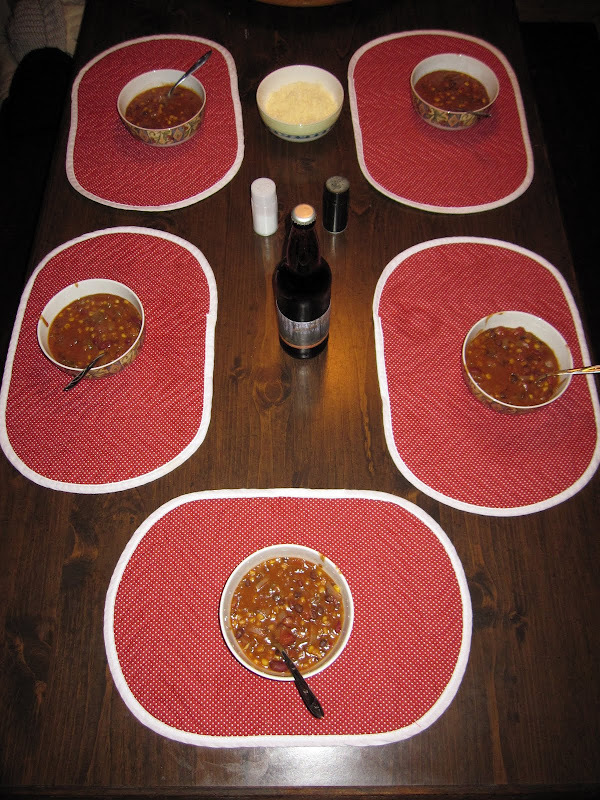 One of our big priorities outside of hitting the slopes and drinking great beer was making chili with our First Place receiving homebrew "Smokey Smoke". Tim along with Jeff's girlfriend Cinzia created a delicious chili from scratch that was clearly only missing one very important ingredient. This was a great idea but there was one sole problem. We wanted to drink Smokey Smoke. And we wanted to drink a lot of it. 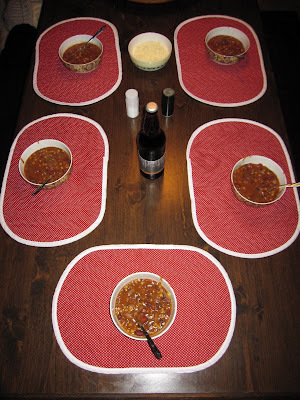 So we were only willing to risk the "loss" of one bottle to the chili. 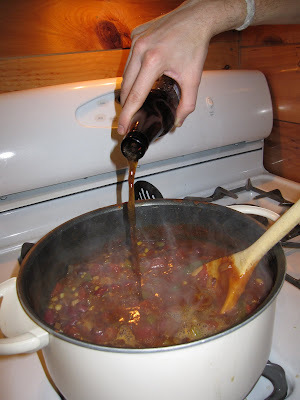 For that amount of chili, it would really serve to add more to get more of the beer's flavor. So overall, a delicious idea that would just need a larger amount next time around. Unfortunately the Smokey supply has been even further dwindled (surprised? ), so it might be tough to do this season. We'll definitely be making the beer again though so here's to giving it another shot in Winter '10-'11!